When you pull a beautifully browned and moist whole chicken out of the oven, you look like a cooking goddess. . . but, my "carving" skills need a little work. . . Emily and I both had a chicken breast, Parker had a thigh and Nate literally had the rest of the chicken (as in the whole rib cage was on his plate) . . . pretty funny! 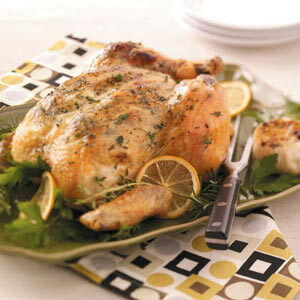 I would recommend SLICING this Herb Roasted Chicken into perfectly, neat, lovely slices! But all in all it was a hit with everyone! A great "herb" taste and served with black eyed peas made this a wonderful New Years Day meal! :-) Did y'all fix black eyed peas? 2. Remove giblets and neck from chicken cavity; discard. Trim excess fat from chicken. Loosen skin from breast and drumsticks by inserting fingers, gently pushing between skin and meat. Sprinkle 1/4 teaspoon salt and 1/2 teaspoon pepper inside body cavity. Squeeze lemon juice into body cavity; place lemon halves in body cavity. Combine softened butter, minced shallots, rosemary, and thyme, stirring with a fork until well blended. Combine remaining 1/2 teaspoon salt and remaining 1/4 teaspoon pepper in a small bowl; rub salt mixture evenly under skin over breast and drumstick meat. Rub butter mixture evenly under skin over breast and drumstick meat. Tie ends of legs together with twine. Lift wing tips up and over back, and tuck under chicken. 3. Place chicken, breast side up, on a rack coated with cooking spray; place rack in a roasting pan. Pour 3/4 cup water into roasting pan. Bake chicken at 450° for 1 hour or until a thermometer inserted in meaty part of thigh registers 160°. Remove chicken from pan; let stand, breast side down, 15 minutes. Remove skin; discard. 4. Place a large zip-top plastic bag inside a 4-cup glass measure. Pour drippings through a sieve into bag; discard solids. Let drippings stand 10 minutes (fat will rise to the top). Seal bag; carefully snip off 1 bottom corner of bag. Drain drippings into a medium bowl, stopping before fat layer reaches opening; discard fat. Carve chicken; serve with drippings. It looks delicious!I came across your site from the foodieblogroll and I'd love to guide Foodista readers to your site. I hope you could add this herb roasted chicken widget at the end of this post so we could add you in our list of food bloggers who blogged about recipes for herb roasted chicken,Thanks!